New Hilton Promotion! Earn Double or Triple Bonus Points per $1! This is our permanent page for Hilton sales & promotions. So you can bookmark it as it will be updated regularly. And to get more discount travel tips & tricks subscribe to our newsletter ! Hilton has announced the Moments Made Bigger promotion. This fall through the Holiday season, you can earn 3X bonus Hilton points at luxury Hilton hotels and 2X bonus Hilton points on other Hilton stays. You’ll need to register and stay between September 10, 2018 and January 3, 2019. And there are still other Hilton promotions going on you can take advantage of! 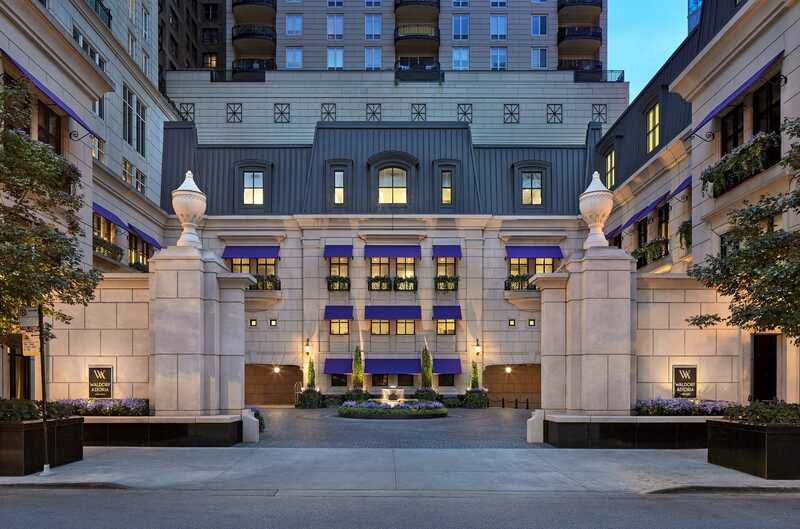 Earn Triple Points at Luxury Hilton Hotels, Like the Waldorf Astoria Chicago! Good Deal or Not: This is a great deal because there is no cap on the number of bonus points that can be earned. The dates of the promotion are during popular travel times (Thanksgiving, Christmas, Hanukkah, New Years, etc) when many folks will already be traveling. Folks with elite status at Hilton will still earn their elite status bonus points on top of the bonus points earned for this promotion. So for example Diamond Hilton members normally earn a 100% bonus over the base points of a hotel stay. In this case, a Diamond member staying at a luxury Hilton property could earn 40 Hilton points per $1 (10 base points + 20 promotion bonus points + 10 diamond elite status bonus points) during this promotion! If you have a Hilton credit card, then you can earn even more points because each card offers bonus points when you use the card to book your stay at Hilton. For example the Hilton Honors Aspire Card from American Express earns 14 Hilton bonus points per $1 spent at Hilton, which can be applied on top of all the points discussed above. Since this card earns cardholders automatic Diamond elite status, then using this card at a luxury Hilton property can earn you 54 bonus points per $1 spend (10 base points + 20 promotion bonus points + 10 elite status bonus points + 14 card bonus points)! This is an incredible promotion for earning a ton of points towards future stays at Hilton. Hilton cardholders and/or elite status members will continue to earn their bonus points on top of the bonus points offered during this promotion. For example, an AMEX Hilton Honors Aspire Cardholder that stays at a $300 per night Conrad hotel would earn at total of 16,200 Hilton points per night during this promotion! Information for the AMEX Hilton Aspire Card has been collected independently by Million Mile Secrets and has not been reviewed by the card issuer. Good Deal or Not: The good news is there’s no cap on the number of bonus points you can earn. These bonus miles are in addition to the Hilton points you’ll earn for your stay. So the rewards you earn could really add up! And the terms don’t exclude award stays from the promotion, so it’s likely they’ll count as well! Miles & More is the frequent flyer program of several airlines, like SWISS & Lufthansa. But isn’t one a lot of people in this hobby often bother with and you’ll pay hefty fees on Lufthansa award tickets. But it’s worth noting you can book some partner award tickets online. And for certain partners, like United Airlines, the fees you pay on award flights are much smaller. Miles & More miles can be useful if you’re able to collect enough of them. For example, a one-way coach flight within the US on United Airlines costs 12,000 Miles & More miles. That’s 500 miles less than what United Airlines charges for those flights (which is normally 12,500 miles one-way). You can save even more using Miles & More miles for transcontinental Business Class seats on United Airlines. For example, United Airlines charges 35,000 miles for a Business Class seat between New York (EWR) and Los Angeles. Whereas if you booked the same flight using Miles & More miles, you’d only pay 17,000 miles. That’s a BIG savings! Normally you earn 10 Hilton base points per $1 spent at eligible Hilton hotels (5 Hilton base points per $1 spent at Home2Suite by Hilton and Tru by Hilton). So with this deal you’ll earn double the base points, so 10 to 20 Hilton points per $1, plus the extra bonus Hilton points you’re entitled to if you have Hilton elite status. And you’ll still earn hotel credit card rewards on top of that! We see deals like this one from Hilton fairly frequently and they’re worth taking a minute to register for because earning extra points doesn’t hurt. But Hilton points aren’t the most valuable hotel points, so it’s probably not worth changing your current travel plans to take advantage of just this offer. However, if it you can stack this deal with the Hilton Lufthansa promotion, that could make it worth a shift in your hotel plans. There is no limit to the total amount of bonus points you can earn with this promotion. However, there are restrictions on the amount of base points that can be earned on a single stay at certain brands.